Older age groups are less likely than their younger counterparts to be regularly active and women are even less active. Ecological models suggest that multiple levels of influence with each level influencing the next level impacts physical activity behaviors. It was found that behavior-specific physical activity, as well as total physical activity, led to a better understanding of factors that may impact behavior among an overall aging population, especially women. 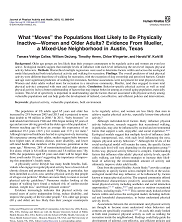 This level of specificity is important in understanding specific factors that are associated with physical activity among vulnerable populations and can help guide the development of tailored, cost-effective, and efficient policies and interventions.